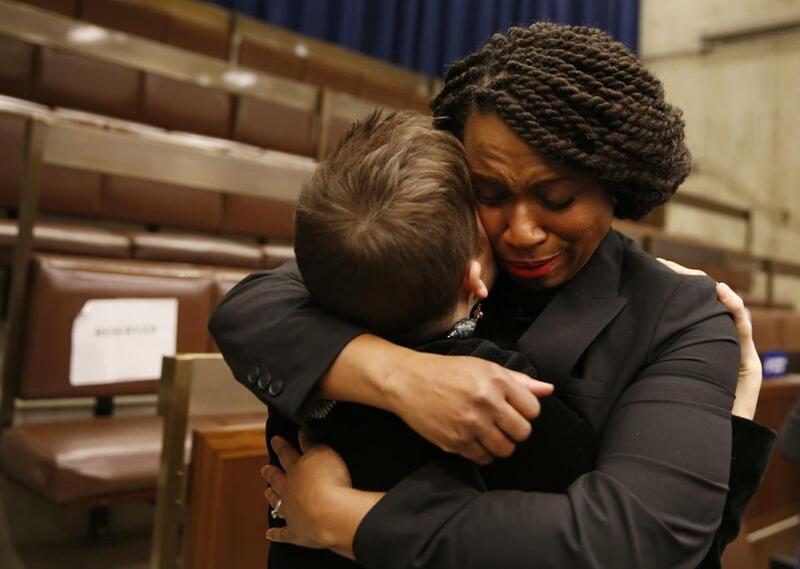 Congresswoman-elect Ayanna Pressley embraced her former chief of staff, Jessica Taubner, following a farewell at City Hall. Ayanna Pressley looked out at the crowded City Council chambers. Her fellow councilors, at their desks, had spent the last hour showering her with praise and tearful goodbyes. 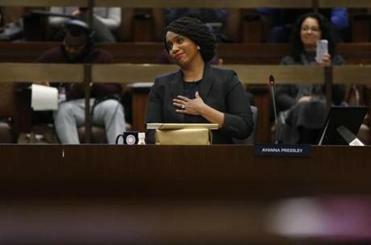 In the gallery, she could see congresswomen-elect Alexandria Ocasio-Cortez of New York and Rashida Tlaib of Detroit, both elected alongside Pressley as part of the grass-roots wave of progressive Democratic victories. Pressley was supposed to be serving as host for an orientation session for the new members of Congress at Harvard. But she had some local business to attend to in Boston, she’d told her new colleagues: her last meeting with most members of the Boston City Council, where she has served nearly a decade. So they decided to tag along. At the gathering, her fellow councilors lifted Pressley — the first black woman elected to the council and the first elected to represent Massachusetts in Congress — as a symbol of the work they strive to do, to bring about economic and gender equality across city neighborhoods. The congresswoman-elect was honored by her colleagues at one of her last Boston City Council meetings. Pressley has served on the council for nearly a decade. “You are the great destroyer of glass ceilings. You are the one who says ‘why not us,’ everywhere you go . . . and because of you, this body is a better, more perfect body,” said Councilor Lydia Edwards, who is serving her first term. Wednesday’s council meeting was a graduation of sorts, or a passing of the torch, with councilors calling on Pressley to bring her mission of advocacy to Washington, D.C. They, in turn, vowed to continue her work here. The councilors praised Pressley, who was elected in 2009, for her work on behalf of young girls and for sexual assault victims; for her work to increase liquor licenses in Boston, to benefit historically underrepresented communities; for helping to plant trees and develop parks in urban neighborhoods; and for her defense of unions, including the National Grid workers who have been locked out of their jobs in a labor dispute. Mayor Martin J. Walsh, making a rare appearance in council chambers, told the councilors that “it should be a happy day for all of you,” knowing that a colleague whom they have sat alongside will be continuing her work in Washington in only a few months. “You’ve been at the ground level for a long time here,” he told Pressley. The mayor presented Pressley with his customary gift for departing councilors, a Paul Revere bowl, modeled after silver bowls by the famous Bostonian silversmith. 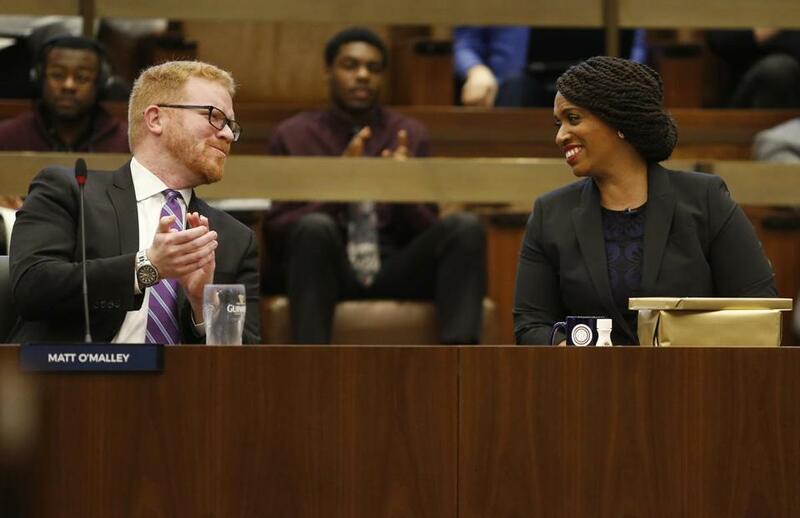 Congresswoman-elect Ayanna Pressley smiled as City Councilor Matt O'Malley wished her farewell at City Hall. Pressley’s unlikely defeat of veteran US Representative Michael Capuano, who had sat comfortably in polls leading up to the September primary election, was one of many Democratic congressional upsets that took place across the country. Walsh, who backed Capuano, was among those surprised. Pressley has referred to Ocasio-Cortez and Tlaib, two progressive women of color who also replaced establishment Democrats, as members of a “squad” of freshmen representatives with many shared goals. Councilor Annissa Essaibi-George teased Pressley’s new friends, noting that she and Pressley were part of the most diverse City Council in Boston’s history, boasting six women of color, including the first black woman president, Andrea Campbell. “They don’t know [Pressley] the way we know her,” she joked. Councilor Matt O’Malley recalled meeting Pressley when she first ran, in 2009. “I remember being struck by the fact that this woman was in it for the right reasons,” he said. And both Campbell and Councilor Michael Flaherty reflected on Pressley’s devotion to her mother, Sandra Pressley, who died in 2011 and whose photo she kept at her council podium. Her mother, they said, would be proud. Pressley urged Essaibi-George to continue her efforts to boost the number of mental health counselors in city schools. She praised Councilor Frank Baker for his effort to combat substance abuse. Pressley said she hoped to continue advocating for those who have been lost in public policy conversations. “Someone has to ask the question, and that one question changes the conversation and shifts the air,” she told councilors. 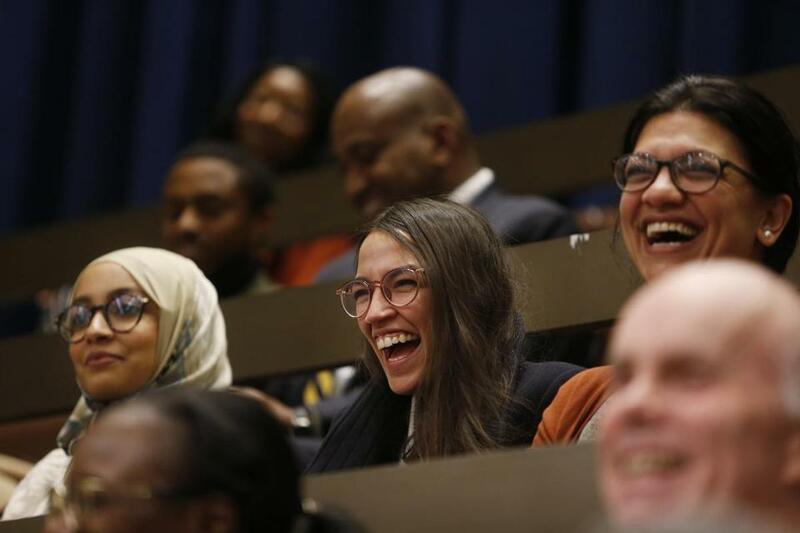 Fellow congresswomen-elect Alexandria Ocasio-Cortez, center, and Rashida Tlaib, right, laughed as city councilors referenced them in their farewell speech to Ayanna Pressley at City Hall.